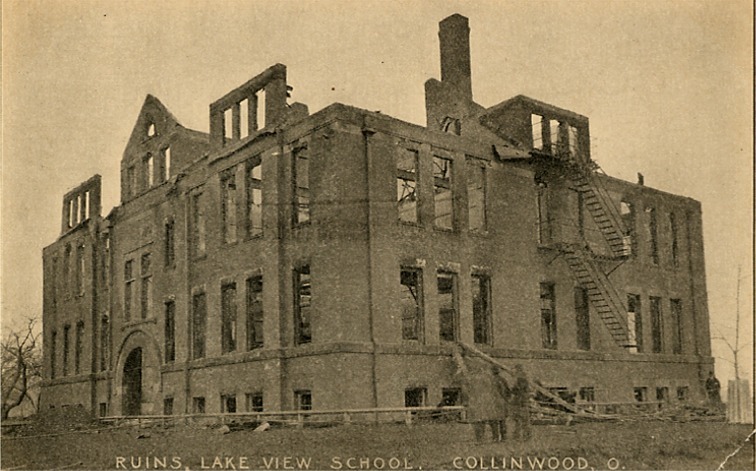 The Collinwood School Fire (also known as the Lake View School Fire) of Ash Wednesday, March 4, 1908 was one of the deadliest disasters of its type in the United States during its era. 172 students, two teachers and a rescuer were killed in the disaster in Collinwood, Ohio, a community that has since been absorbed into the city of Cleveland. While the Lake View School was built with load bearing masonry outer walls, much of the four story building’s floor structure system used wooden joists. It was one wooden joist that caught fire when it was overheated by a steam pipe. The building’s main stair case extended from the front doors of the building, up to the third floor; without benefit of fire doors, the stairwell acted like a chimney, helping to spread the fire quickly. Oiled wooden hall and classroom floors also fueled the fire. A common misconception about the building’s design is that the doors opened inward. Doors to the building were equipped with common door knob latches. As panic leading to the crush of a large number of students in stairwell vestibules contributed to the death toll, students also died as a result of smoke inhalation and the fire itself. We can learn from the past and work to protect the built environment, see some of our previous posts on large loss fires and disasters. There’s a myriad of things, very similar to a shopping list that could have been done. One of those things could have been; be more involved at the initial construction of such facilities. What goes in behind solid walls and ceilings AFTER the sheet rock goes up is tactically important to the overall survival of the people and the structure. “Ever Vigilant”, we should be as inspectors. Question it before, “is that right, lets look at that”, is better than, “did we leave enough space on that flue/ what is the air gap supposed to be”? We are not perfect, none of us are, we need to be more vigilant for future’s sake. People are trusting us. People are relying on us. Our name goes on the work . . . like an Artist on his creation.